Why does God not want us to be controlled by the past or to be fearful or cowardly? Does Love cover you? Do you use it to cover others? We are to be fueled and empowered by Christ’s attitude of love in all situations. How? Christian love is the turning of our backs on our self-concerns and facing our neighbors. It is the surrender of our will to His. If love does not take us beyond our self-interests, then we have only lust and pride, not real love! God’s love must be our model for life. It must flow into us from Christ, and in return, flow out from us to those around us. Why? God’s love is the ultimate power for the Christian. Love is more than a feeling; it has segments and characters to it. Love is also a choice, a decision that must be perused and worked on (John 13:1; 15:13;1 Corinthians 13:3; 1 John)! What will come from us? “God may be praised.” Here, this means for us to be good stewards, as we are called to live, serve, and do all that we do in life for the honor and glory of our Lord and Savior (Acts 7:38; Rom. 3:2; 1 Cor. 1:26-31; Jude 24-25)! What does this mean? How will it benefit me and my church? God does not want us to be controlled by the past or to be fearful or cowardly. Rather, we are to learn from our experiences and grow from them, but not be tied to them so they become our identity. We have been born again in Christ; our old life is old, and it is no longer who we are. Thus, we are to grow closer to Him and be an example to others who are still in the old life without being influenced and enticed by them. Our focus needs to be what is going on now, what God is doing, and how we can contribute to it. Not just what can I get, but what can I learn and gain to be better for His glory? Take comfort; God does indeed have a plan for you even when you cannot see it. His will for your growth in Him is clear! He wants you to be faithful and good so others can see in you a demonstration model for the new life that they can have too. He gives you the ability, the power, and the strength to endure and to enjoy (Gal. 6:7)! The most important aspect is for us to keep our eyes focused on Christ, with racehorse blinders on to block off the rest. How can you have a better mindset to learn and grow from your experiences? What can you do to be on guard against the sins and enticements of others? If you are not, how do you suppose the sins of your heart would break you down and take you over? What can you do about it? 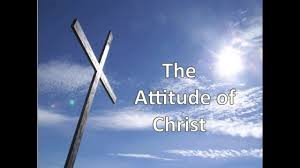 Do you have the Attitude of Christ! However, we cannot do that if we are not following Christ and taking heed to His example, His grace, and His love so we want to respond. That means we can be living in sin, pointing to ourselves, leading by power and control or by pride. Otherwise, our desires will fill that gap and will get the best of us. The sins of others and the sins of our heart will break us down and take us over and destroy the church you serve, unless we focus on Christ, His ways, and His path. What does it mean to wholeheartedly look to Christ? How can you better implement this in your life? What would your church look like with this mindset at full blast? Servant Leadership is exercising real, godly leadership, as Christ did when He used a towel, and influencing, equipping, and empowering people to accomplish God’s purpose and plan. This is about serving others unselfishly while influencing and empowering them to grow in a Christ-directed, purposeful direction. This was an uncommon trait in Jesus’ time, just as it is in ours; do not let it be uncommon for you! Being a leader in the church, or in the home for a husband, is never a force of personality; it is earning that respect because you love and care. We are not in leadership for power, control, or for personal gain. Rather, we are to point others in His direction by our example. Consider that Jesus clearly tells us that a leader should behave like a servant (Luke 22:26)! Jesus took a towel and washed His disciple’s feet. This is an act we can easily glance over, missing its significance. But this was God, Creator of the universe, performing the lowest job in that culture—washing someone’s feet. If the President of the United States came over to clean your toilet, it would be a pale comparison! This is an example for us—we are never too high in our position to perform the lowest tasks, because, it is not the task—it is our servant attitude that is important. Samson was a Judge for Israel (Judges 13-16). His primary responsibility was to lead his people, and defeat the Philistines. He chose, instead, to party and pursue women that were not right for him. The end result was that his strength was taken away; he was blinded and powerless. Only at the literal end of His life did he call upon God. He wasted his leadership and abilities on foolish, meaningless gains and manipulation. How sad that so many of our church leaders do the same. We are given precious opportunities and we squander them, pursuing trends, personal needs, and desires—and not God’s Will! Real Biblical leadership for the church is never a force of Will or personality. Leadership embodies the fruit and character of our Lord. It requires being a servant before you attempt to direct others. If a leader just directs and never serves, there is a good chance he is not a real leader; rather, he is a pretender, exercising his agenda—not God’s call and Will. Is real godly Servant Leadership working in you? Building a Church that points to and honors ME!? These next few blogs will be about learning from enigmatic, prideful, megalomaniac folks who have new trends and ideas, who are on the cutting edge, who seem to come across as relevant, impacting, inspiring, exciting and connecting… so we can move our church closer to ourselves and further away from Christ. Then I can say, look at ME! And to do that, I need to do? Look to myself! Look to others I like and who I would like to be like. Then I need to seek, what can I do to ignore the Bible and God’s Word, replace it with my ideas and the latest and greatest movement and claim I am great; I am His most vital servant and trendsetter? Me, me ,me, me, church is all about me, what I want, what I need, who can please me to make me look and feel good??? Sounds good right? It should be, this is our sinful nature at work, that is what most pastors and churches are doing these days either by fault or by happenstance. Perhaps what you are doing, right? Think not?! Then drop to your knees! But…do you do this: How do I please myself, how do I get people to please me and to focus on me and my desires and how do I get my church people to bend to my will has their lord and master??? Seriously, is there even a hint of this in you or your church? I know it has been in me… placing the focus on the self and not on The Christ! If so, REPENT or get out of ministry! OR, or, or, we can do it right! Look to Christ! We can model, learn and seek Who Christ is and what He has done, His Lordship and live out and communicate this in love to be a Church in His Love to share His love….Building learner’s, builder’s, and appliers’ of His Word and Love! Why would a Christian insist on relying on his/her self-importance or position? In John 13:1-17, we are given a template of servant leadership! Jesus dominates to us that real, biblical leadership for the church is never a force of will or personality. Leadership embodies the fruit and character of our Lord. It requires your being a servant before you attempt to direct others. If a leader just directs and never serves, there is a good chance he is not a real leader; rather, he is a pretender, exercising his agenda and not God’s call and will. Servant Leadership is simply following the character of our Lord into a management model. What can you do to make sure the motives of your management model are right and not self serving? How does the fact Jesus is the God Who serves matter? How can you better demonstrate what Jesus does? Jesus not only set the example, but more importantly, also redeemed us. Jesus clearly tells us what a leader is and how one should act and work. It is not about pride or power or control; it is about being a servant. A pastor or a Christian leader must not be in leadership just to command or be in charge for any reason beside how do I teach and exhibit Christ and what is the best way for me to do this? Leadership must not be to satisfy one’s pride or desires, or for personal gain. Rather, we are to point others in His direction by our example. If pointing to Christ is not our goal or purpose, then we are in the wrong position. We must exit the church as fast as possible, drop to our knees, repent, and get right before God before reentering. Leadership is all about Christ, not us or even our vision; it is purely and plainly how do I glorify and serve. Just look how our LORD God, Creator and Sustainer did. Jesus took a towel and washed His disciples’ feet. This can be an act we can simply use for a “Maundy Thursday” service (a reflection before Easter) and never give it much more thought. It is something where we may act more like Judas or Peter, missing its significance and refusing to apply it to our hearts, minds, and mission. If God, Creator of the universe, performed the lowest job in that culture—washing feet—then who am I to think I am better? Jesus is our example; we are never to think too highly of ourselves or buy into our own propaganda to perform tasks we are called and made for. It is not about mission; rather, it is who the Mission is for and how He has called us to be within it. Our servant attitude is imperative!